These loaded camping rental kits make camping easy and fun. Each kit is loaded with everything you need to look like a camping pro with clear instructions and amazing, premium camping gear. Just like you wouldn’t rent some of a car, why rent just some of what you need. Mountain Side Gear Rental provides you with an entire kit: the tent, sleeping gear, cooking and lighting gear and plenty of extras. You can upgrade the camping tent and cooler if you like and there is a selection of sleeping bags to choose from that match your comfort level. To make sure you pack everything you need for an epic adventure, print a copy our Camping Checklist. If you have more than four people in your group then simply upgrade to the largest tent and add two sleeping bags. 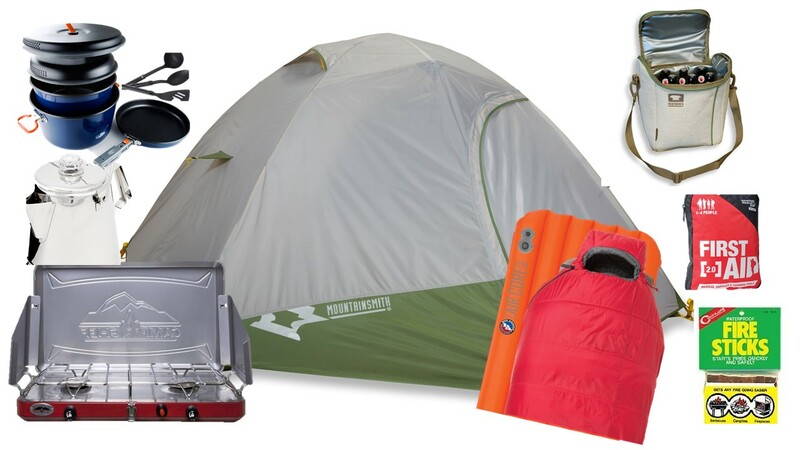 This complete camping rentals kit has everything two people need for an incredible camping trip! Whether it is for a weekend in the Appalachians or a month long grand-tour of the Western National Parks, this kit has more clean, comfortable gear than anywhere else. Only MSGR includes this much incredible camping rental gear in one kit. Upgrades are available. This complete camping rentals kit has everything three people need for an incredible camping trip! Whether it is for a weekend in the Appalachians or an amazing trip to Yellowstone National Park, this kit has more clean, comfortable and easy-to-use camping gear than anywhere else. Only MSGR includes this much incredible camping rental gear in one kit. Upgrades are available. This complete camping rentals kit has everything four people need for an incredible camping trip! Whether it is for a weekend in the Appalachians or an amazing trip to Yellowstone National Park, this kit has more clean, comfortable and easy-to-use camping gear than anywhere else. Only MSGR includes this much incredible camping rental gear in one kit. Upgrades are available.